Warner Home Video released The Man from U.N.C.L.E. - The Complete Series to DVD back in 2008 but it was mighty pricey then and now. I'd only seen bits and pieces of the series through the years - for some reason it and other MGM-owned shows like The Outer Limits rarely if ever got syndicated in the Detroit market where I grew up - and I didn't dare chance it on a series I wasn't certain I'd like. Further, the general consensus was that this 1964-68 spy series went downhill in a big way during its third season, having been influenced by the camp and self-parody of the phenomenally if briefly-popular Batman TV show, as well as the ballooning if increasingly silly ‘60s spy craze. (U.N.C.L.E. recovered somewhat for its more serious final fourth season.) Others, like the great pop culture essayist Mark Evanier, loved the show as a child of the ‘60s only to be terribly disappointed upon revisiting it as an adult. All that makes The Man from U.N.C.L.E. - The Complete Season 1, a new release, much more appealing. This writer prefers his TV spies more serious and dignified, Patrick McGoohan's Danger Man to the spoofy antics of The Wild Wild West. U.N.C.L.E. 's first season shows are definitely closer in spirit to this former style. Indeed, at this point in the show's history U.N.C.L.E. almost looks more like a cousin of British ITC's ‘60s spy-type shows (Danger Man, The Saint, Man in a Suitcase, etc.) than the average mid-‘60s network program. Warner's DVD release offers no extra features at all but does present all 29 first season episodes (its only year in black-and-white) on ten DVDs, generously spacing them out at an average of just three 50-plus-minutes episodes per disc. The Man from U.N.C.L.E. premiered on September 22, 1964, just days after Goldfinger's U.K. opening, and two full months prior to its release in America. The 007 movies were fast becoming an international phenomenon but weren't quite there yet; the spy craze didn't fully bloom until late-1965, during the anticipation for Thunderball and the double feature reissue of the first two Bonds, Dr. No (1962) and From Russia with Love (1963), which is when many first saw them. "Contractual obligations," i.e., Fleming's legally-bound exclusivity with the Bond franchise, forced his premature departure from U.N.C.L.E., though this wouldn't have matter much: Fleming died on August 12, 1964, before the first episode even aired. Felton hired Have Gun - Will Travel co-creator Sam Rolfe to replace him. Rolfe turned out to be a good choice, as he favored a more serious approach to the material. He left after the first season, and the show went downhill from there. Just as the movie Bonds had been influenced by Alfred Hitchcock's North by Northwest (1959), most explicitly in a man vs. aircraft set piece that turns up in From Russia with Love, so too was The Man from U.N.C.L.E.. Most obvious was the casting of 78-year-old character player Leo G. Carroll as U.N.C.L.E. 's headman, Mr. Waverly, Carroll reprising his role from North by Northwest in all but name. Curiously, Carroll was not everyone's first choice. The series pilot, filmed in color in late 1963, had featured actor Will Kuluva in the Waverly role, then called Mr. Allison. Balding and usually bearded, Kuluva was an odd choice; he usually played working-class ethnic types, particularly Hispanics and Eastern Europeans. NBC executives didn't think much of the pilot, one famously advising Felton to drop "K…K-something." Felton assumed he meant Kuluva, whom he'd wanted to replace with Carroll anyway, but when the executive saw the reshot scenes featuring Carroll he was confused. It turns out the executive wanted Felton to jettison "Kuryakin," U.N.C.L.E. 's resident Russian agent, Illya Kuryakin, delightfully played by Scottish actor David McCallum. McCallum's role in the pilot and some of the early episodes was small, sometimes barely more than a walk-on, but audiences embraced the character (McCallum became a heartthrob among teenage girls) and McCallum's chemistry with Vaughn. The Man from U.N.C.L.E. cribbed its basic format, one that it adheres to a bit too strictly, at least in this first season, from North by Northwest (and other Hitchcock thrillers), in which an unsuspecting civilian is temporarily conscripted in U.N.C.L.E. for a few whirlwind days of adventure, glamour and danger, with Solo training and protecting his charges just as Cary Grant does in Hitchcock's Notorious (1946). Having seen precious little of The Man from U.N.C.L.E. up until now, I was generally impressed by these first season shows. The series gets off to a rocky start, partly because there's too much emphasis on and repetition with the "innocent" characters brought into U.N.C.L.E. 's operations, though Robert Vaughn is excellent as their (Here Comes) Mr. Jordan-like guide. Suavely projecting obvious intelligence (Vaughn later published his Ph.D dissertation on the Hollywood Blacklist), he is perfectly cast, similar to McGoohan's Danger Man persona (from that show's first, 1960 series), the main difference being Vaughn's quiet confidence vs. McGoohan's cynicism and boiling intensity (more apparent in Danger Man's 1964 revival and 1967 follow-up, The Prisoner). But it's when McCallum becomes a legitimate co-star that The Man from U.N.C.L.E. really starts hitting its stride. "The Project Strigas Affair" is a typically entertaining show, one that, coincidentally, brings together William Shatner and Leonard Nimoy nearly two years before their first episode of Star Trek aired. 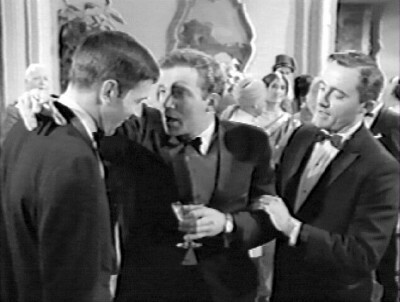 Directed by Joseph Sargent and written by Henry Misrock, this episode deftly anticipates myriad Mission: Impossible plots: discredit a dangerous politician/influential millionaire/gangster by enticing him with a wholly-fabricated get-rich-and-powerful scheme that, in the end, will only make him look like a dangerous fool to his compatriots. In this case the villain is a vaguely Balkan politician played by a pre-Hogan's Heroes Werner Klemperer, with Nimoy and Woodrow Parfrey (excellent here) among his aides. Shatner plays the "innocent" amateur spy in the episode, which gives equal good time to Vaughn and McCallum. Presented in its original 4:3, 1.37:1 format The Man from U.N.C.L.E. looks just fine, particularly after the pilot, shot in color but presented here in black-and-white as originally aired. Collected in a sturdy DVD case, the set includes a brief message from Vaughn and McCallum along with episode titles and air dates, but no other Extra Features. The Dolby Digital mono is fairly strong, and the discs are region 1 encoded. Most enjoyable, this first season of The Man from U.N.C.L.E. is Recommended.